With more than 120 resorts in the Maldives, trying to pick the best one can be a bit of a headache, which is why we’ve come up with a handy guide to help you out. 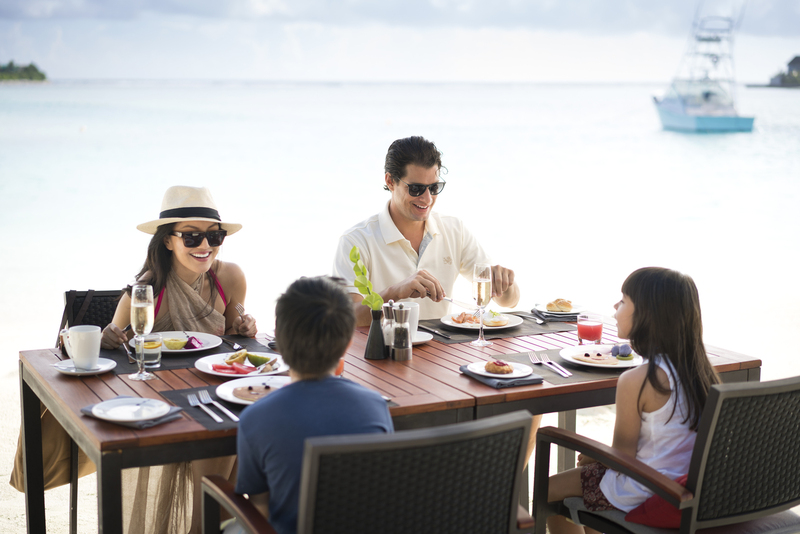 Do you want to know which is the best resort in the Maldives for families are? Or perhaps you’re wondering about the top things to do, or which island is the best overall. To be honest, the answers can depend on what your priorities are, but worry not! We’re here to help you navigate. If you’re booking a family holiday in the Maldives, it’s really important to book the right resort, as there’s nothing worse than having bored kids! Many resorts in the Maldives offer special facilities and services for kids such as Kids Clubs, but the quality and quantity can vary greatly. That’s why you need to choose a resort that has a big variety of activities and entertainment for children (it’ll also allow you to enjoy the holiday more too.) Let’s also not forget about checking if they offer the all-important baby-sitting services so that you will be able to have a romantic dinner for two or simply strolling together under the stars! Resort baby-sitters look after your kids in your own villa after the Kids Club has closed its doors for the day (usually around sunset). Centara is an affordable, good-quality option for families. The nightly rates are low, plus you can save even more money with the all-inclusive plan. 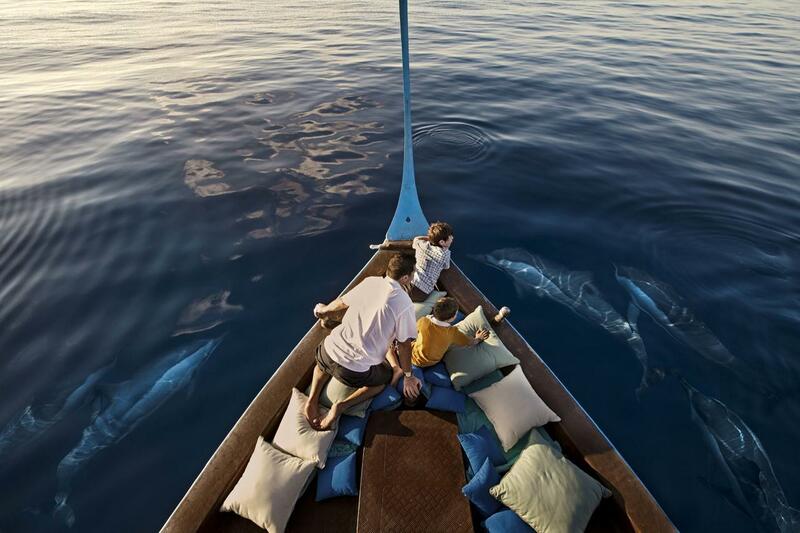 It was voted the Maldives’ most family-friendly resort for two years running. There’s a large Kids Club as well as a cool lounge-style Teen Club with computer games (an often-overlooked demographic! ), as well the usual baby-sitting services, a special children’s swimming pool, tennis court and a host of motorised and non-motorised water-sports such as inflatables pulled by speedboats, canoes and paddleboards. To cap it all off, the resort even has computer games in some of the villas and a real shipwreck sunk on its house reef which can easily be accessed by snorkellers. Those clever people at Anantara spotted two beautiful islands lying adjacent to each other in Male’ Atoll and came up with a genius idea: they decided to create twin resorts side-by-side: one offering a romantic honeymoon experience and the larger of the two for families and groups of friends. Both resorts have almost identical facilities, and guests are welcome to use facilities on both islands, but the smaller one has a more chilled-out, romantic vibe whereas Anantara Dhigu is larger and has more of a fun vibe. Kids can meet other kids and explore the island while the parents don’t need to worry about them bothering the neighbours. Dhigu has a great Kids Club, babysitting services as well as children under six can dine for free. It also has all the usual water-sports facilities including free snorkelling and kayaks. This is a high-end option for families who like their resorts chic and sleek. However, it has none of the stuffiness that you may associate with a luxury property and the all-inclusive plan is a superb way of saving money for your family. In fact, the entire resort ethos is about making the island feel like your home. So, put your feet up and let the kids be kids! There’s a big kids’ club, casual dining including a beachside fish and chip restaurant and an excellent marine biology centre where your children can learn about the pristine wilderness surrounding them. The resort has heaps of water-sports and excursions available plus soccer and tennis facilities. As an added bonus, it’s in the Baa Atoll UNESCO World Biosphere Reserve, so if you visit between May and October you can take the kids to search for mantas and gentle whale sharks. Feel free to find out more details on all of these fantastic resorts in the Maldives on Neoscapes’ website. “What’s the best island in the Maldives?” We get asked that question all the time. The thing is, the answer actually depends on what you’re after, which is why a personal consultation with one of our experts is a good idea. One person’s idea of the ‘best island’ can vary so much, as their idea of the best could be the most luxurious island, or it could be the most interesting island. To give you some food for thought, here are our Top 3 picks of the best islands for honeymooners, families and scuba diving. There are two main things people want from a honeymoon destination: wow-factor and romantic seclusion. Park Hyaat Maldives Hadahaa has both of these in abundance – and so much more. 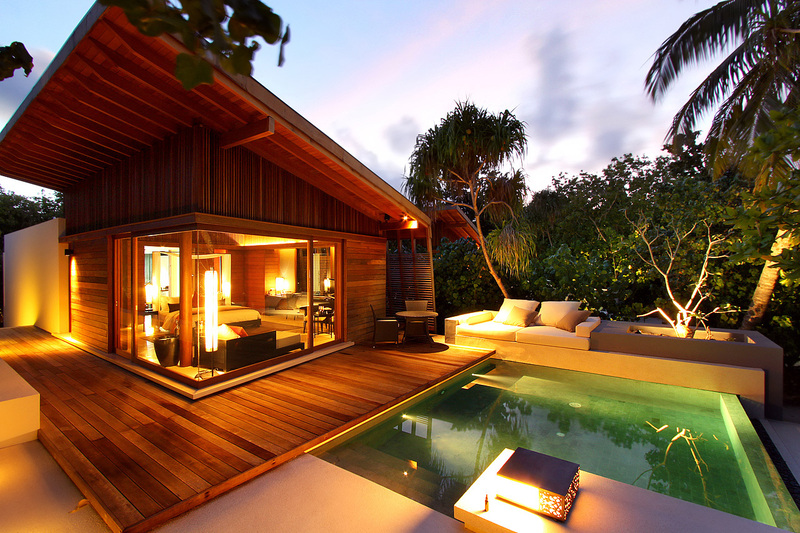 The contemporary island-chic architecture is stunning; achingly luxurious but cool at the same time. Then there’s the house reef which (remarkably) was deliberately left untouched during the construction phase and as a result the coral is still in good condition. It’s located just 55km from the equator in one of the world’s largest and deepest atolls. While this necessitates an internal flight followed by a 30-minute speedboat journey, it’s worth the extended journey time for the sublime sense of privacy and seclusion. You’ll barely see any planes passing overhead or fishing boats chugging by, as you do in atolls closer to Male’. The luxury beach and water villas are discreetly positioned around the island and decorated in a stylish, minimalist way. Many of them have terrazzo bathtubs and private pools. You can request a special honeymoon package in the Maldives or learn about some of our great offers on wedding packages in the Maldives, just ask one of our experts. 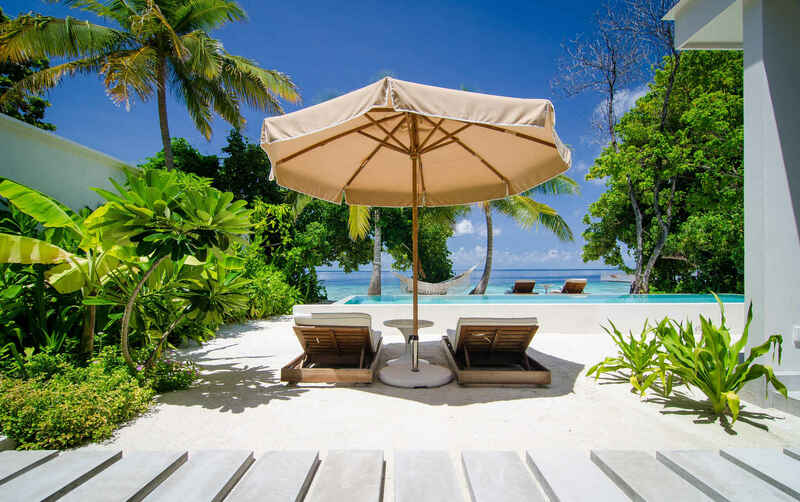 We highlighted some of the top resorts in the Maldives for families at the start of this post, but answering which is the best resort for families is a slightly different question to which is the best island for families. You may already know that each island in the Maldives is only allowed to have one resort on it. 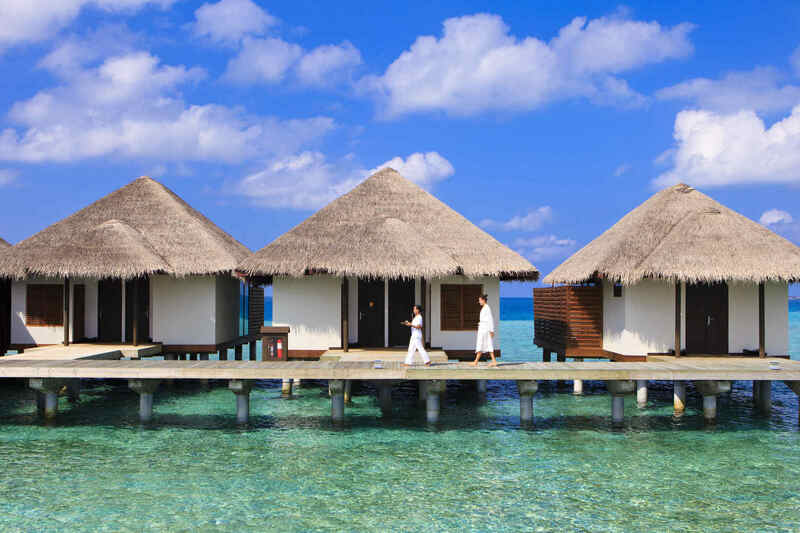 The resort is usually a Maldivian or international brand, such as Coco Collection or Hilton. So, when we’re talking about the island in particular, we’re talking about the nuts and bolts of your Maldives experience – or to be specific, the landmass, location, beach and lagoon. Why does this matter? Because if you’re bringing kids, you probably don’t want to be cramped on a tiny island for the duration of your holiday. Some islands can be as little as 20m wide, which can be romantic for honeymooners but can feel a bit small when there are kids running around and you’re staying for two weeks! Then think about the lagoon. Ideally you want a shallow, kid-friendly lagoon and a decent amount of sand for them to explore and play upon. One of the best islands for kids is Four Seasons Resort Maldives at Kuda Huraa. It’s a decent size (by Maldivian standards) at 530m by 160m, so there’s plenty of space for the kids to roam around. The beach is broad and the lagoon doesn’t get deep quickly, unlike some lagoons such as the one at the fabulous Park Hyaat Maldives Hadahaa. However, as with all islands in the Maldives, you’ll need to keep an eye on the current each time; which can be deceptive due to the glassy water – we’d suggest you all avoid the channel between Kuda Huraa and the inhabited island of Huraa. Kuda Huraa is also not far from the airport (35 minutes by speedboat), which is ideal after the stress of an international long-haul flight. All of these things are the icing on the cake, on top of the excellent kids’ club, child-friendly interactive marine lab with baby turtles and clownfish, ‘Maldivian village’ cultural display, impressive collection of water-sports gadgets, heaps of excursions, and an excellent surf school. Plus the impeccable Four Seasons service (having a personal butler to take the hassle out of making any arrangements is a blessing for frazzled parents!). While practically all resorts in the Maldives have diving centres, we’ve found that some are better than others. Although the visibility is usually very good across most of the Maldives (except for the lower visibility in Addu Atoll), your diving experiences can vary. This is due to a number of factors, such as the depth of the water in the atoll, which can affect the quality and health of the coral. Plus, there are some spots in particular which offer better than average scuba diving experiences for reasons such as there being shipwrecks there or the area being known for an abundance of whale sharks and mantas. 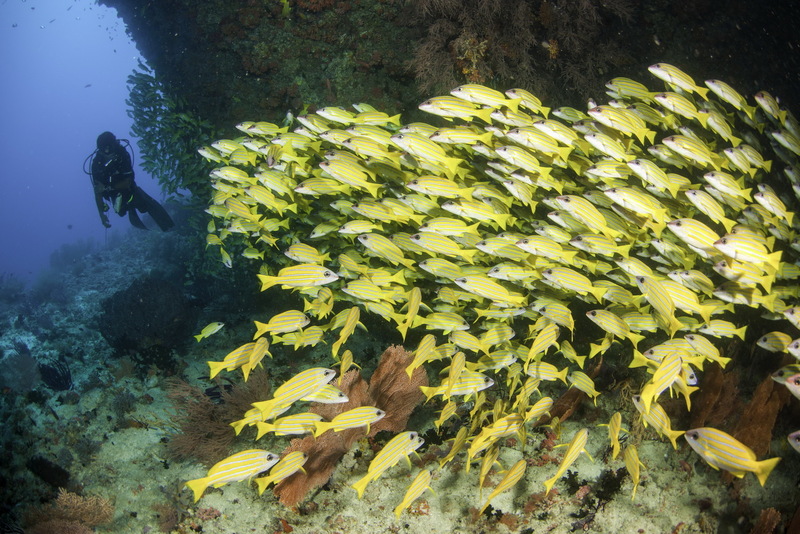 All these factors make it hard to pick just one resort as the top one for scuba diving. However, one of the most popular diving resort amongst guests is Kuramathi in Rasdhoo Atoll. This is a resort where you’re bound to rub shoulders with a lot of other divers, so you can swap stories and opinions on what you’ve seen. And one of the biggest draws of all is Hammerhead Point. This famous dive spot is just a stone’s throw from Kuramathi (8 minutes by boat) and it’s the only site in the Maldives where hammerheads are known to congregate all year-round. The best time to see them is at dawn. The resort is surrounded by all kinds of other excellent dive sites both in the tiny Rasdhoo Atoll and the adjacent North Ari Atoll. You might be able to see napoleon wrasse, trevally, mantas, turtles, reef sharks and tuna. Kuramathi is also one of the few resorts in the country with a hyperbaric chamber. Don’t listen to anyone who tells you there’s nothing to do in the Maldives except for sitting on the beach. While it’s true that it’s one of the most beautiful spots in the world for sunbathing, every single resort offers activities, experiences and excursions so you can choose to be as active or as laid-back as you please. These are the two most popular activities in the Maldives, and for good reason! The water is warm (an average of 29c throughout the year) and very clear, often with visibility of up to 40m. Even if you’ve never tried snorkelling or diving before, it’s an excellent place to learn because every island is well set-up for beginners. Almost every island has a ‘house reef’ attached to it, and many offer free snorkelling equipment, so you can explore on your own just metres from your villa. 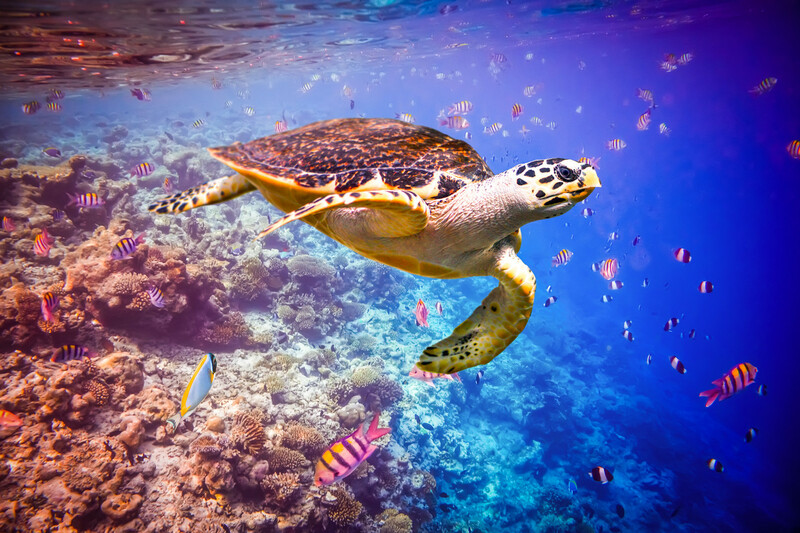 The Maldives also has a real abundance of marine life, so you’ll find the colours and shapes fascinating. Just remember to never stand on the coral because it kills it! The country is also great for experienced divers, with technical dives, wreck dive and drift dives being amongst the exciting options. The Maldives is one of the few places in the world with a year-round population of whale sharks. There are two main hubs for whale-shark spotting (depending on the time of year). 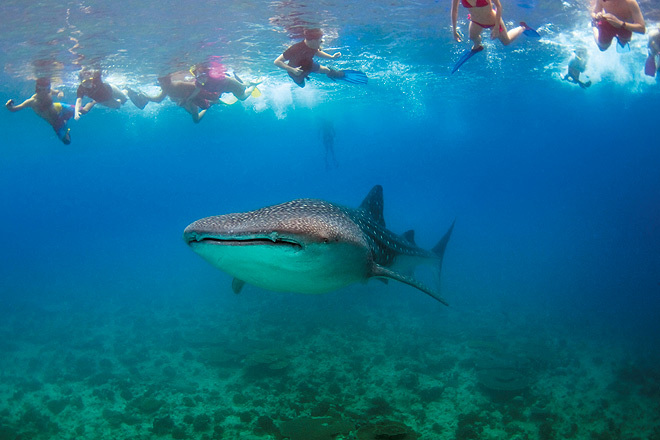 From May to October, Baa Atoll is one of the best places in the Maldives to swim with whale sharks. Then during the rest of the year, Maamigili in South Ari Atoll is the most common place to find them (in fact, they can often be found all year around Maamigili; it’s just that this season is the peak time for spotting them there). You might find a lot of other people want to see them too, so when you do get in the water with them, try to follow the Maldives whale shark guidelines and don’t get any closer than 3m. It’s not that these gentle plankton-eating giants are dangerous, it’s just that it’s unpleasant for the whale sharks to have people getting too close to them, plus you could accidentally harm them if you touch them. Going to the spa is a must in the Maldives, after all, the country is renowned for its luxury spas. As with the dive centres, practically every resort in the Maldives has a spa. In general, the massage therapists (often from Indonesia, Thailand and India) are trained to high standards and the signature massage will typically be a blend of Balinese and Swedish massage. Many resorts throw in additional types of massages to their repertoires, such as sports massage, Ayurvedic massage, or even more unusual offerings such as sand massages and water massages. You can request a personalised wellness or spa package at some of the best resorts in the Maldives – just ask one of our experts. Or, feel free to browse some of our existing packages and offerings orientated around wellness and spa resorts in the Maldives.